The key to a properly designed liquid cooling system is the Coolant Pump. We knew that in order to do the job right we would have to design a custom pump specifically to meet the unique requirements of a liquid cooled aviation engine. A pump that would provide the necessary circulation flows and pressures to handle an engine putting out high power over long periods of time and a pump that would provide thousands of hours of trouble free service. Completely erase any thoughts of comparing the pump that we have designed to any automotive or marine engine's water pump. From the start we decided that a gear driven pump would ensure optimum reliability. Pulling from our high performance racing experience we designed a pump unlike any water pump you may have seen before. At first glance some people think it is a small turbocharger. Our pump incorporates a highly efficient impeller housing and a prioprietary impeller. 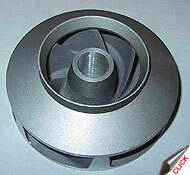 In fact this is the same impeller that is used on various Formula I race engines. 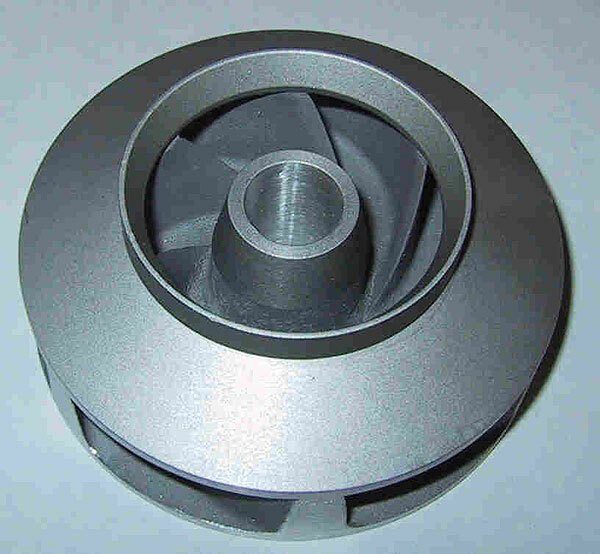 In those applications the impeller is turned at over 8000 rpm in order to cool engines that are producing upwards of 800HP! To ensure a healthy TBO safety margin, the design life of our pump is over 10,000 hours! The Coolant Pump is gear driven directly from the accessory housing of the engine and is the essence of simplicity with a minimum parts count. It is mounted to what is commonly referred to as the governor accessory pad which when looking directly at the rear of a Lycoming O-360 accessory case. The picture above is of our latest pump and step up gear housing mounted to the govenor pad of an O-360 engine. The Coolant Pump impeller is a proprietary, high efficiency, encased/shrouded design in order to provide the necessary pumping performance. The standard coolant pump for the O-360 series engines incorporates a step up gear in order to provide the necessary impeller speeds. 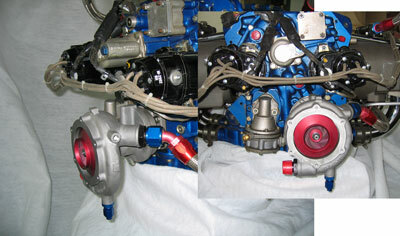 The pump is divided into two distinct housings – the step up gear housing and the impeller housing. The step up gear housing attaches directly to the O-360 series accessory case and will engage the engine's internal drive gear directly. The impeller housing then attaches to the step up gear housing. Both the step up gear and the impeller shafts are plain bearing design and are lubricated by pressure oil provided by the engine at the accessory attach pad. The input shaft drive gear of the step up gear drive is designed to shear in the event of an overload or seizure of the pump or gear assembly. The impeller, gear housing and impeller housing are cast from the same A356 alloy as the cylinder head/coolant jacket and is T6 hardened. 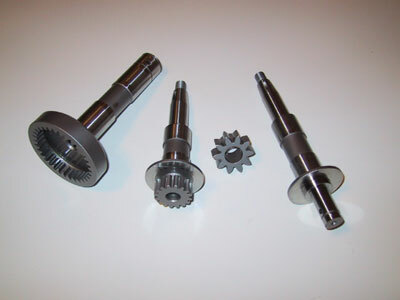 The only steel components are the impeller drive shaft, accessory drive shaft and gears. All of these parts are machined from billet 8640 steel and are then carburized and tempered. One of the most important aspects of the design is the use of a long life ceramic water seal rated at over 12,000 hours mean time between failure (MTBF). Since we expect the water pump to be overhauled when the engine reaches TBO this seal provides 4 times the service life expectancy than a 3000 hour engine TBO. 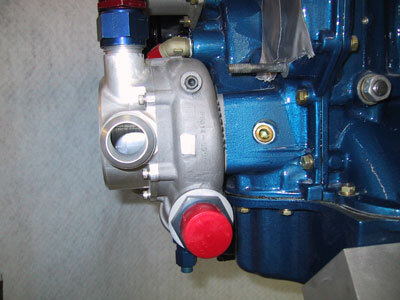 For the O-540 series engines and for those O-360 engine installations where there is a minimum amount of space between the firewall and the engine we designed an ultra-compact water pump that mounts to the same lower right accessory pad. This compact pump sticks out less than 1" past the right side magneto yet it is capable of providing proper circulation to cool over 450HP! The compact pump installs directly on the lower right accessory pad of any single mag (two individual mags on the acessory housing) O-540 engine. For the O-360 engines, internal modifications to the accessory gear train and accessory housing are required to run the compact pump.